What’s the only thing better than working at Wrigley Field on a Friday afternoon? Getting out of the office and turning work into play with Urban Initiatives’ team from Morton Elementary! 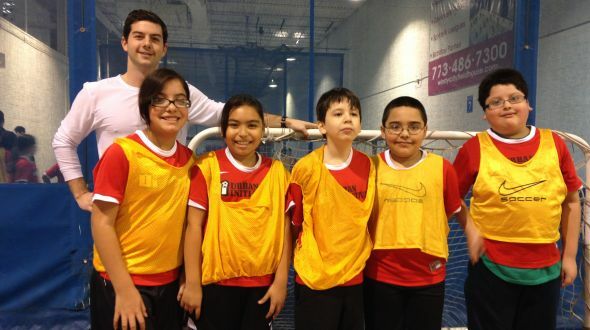 Last week, a group of Chicago Cubs volunteers spent the afternoon with 35 energetic players at Windy City Fieldhouse. When the big kids from the Cubs arrived, they warmed up with a lightning fast (and hotly contested) game of bridge ball. Minutes later, Morton’s team came running into the gym ready to play some soccer. The Cubs jumped onto the fields and each volunteer joined a team of Morton players. “When I count to three, the game starts,” explained A.J. from the Cubs as he balanced the ball between two of the kids’ backs. “One, two, thr-…” he counted, and the kids ran off after the ball, nearly taking A.J.’s arm with them. As the games wound down, the teams of volunteers and kids came together for a discussion about healthy eating. The two groups couldn’t come to a consensus on their favorite vegetables (Morton’s squad was pro-carrots, the Cubs were heavily in favor of broccoli), but everyone agreed vegetables were delicious. “I wish these guys could come out every week,” said third grader Jamaya as she snacked on a post-game apple. We couldn’t agree more. A huge thank you to the Chicago Cubs and the team of volunteers who joined us on Friday. Go Cubs go! Previous Article: Recess at (Not Quite) 20 below?